The College Reporter | What does the future hold for a 2018 Warrior-Cavalier NBA final? What does the future hold for a 2018 Warrior-Cavalier NBA final? At the beginning of the NBA season, a fourth straight finals between the Golden State Warriors and the Cleveland Cavaliers seemed like all but a formality. With the Warriors resigning everyone in their core group of players and the Cavaliers adding all-star Isaiah Thomas, all of the analysts and fans expected the two teams to face off one more time. However, the outlook does not look as clear anymore after multiple trades and the seeming implosion of the Cavaliers core group. Right as the trade deadline approached, the Cavaliers stripped their roster down to the core in order to fit around Lebron James and help him secure his second championship for the city of Cleveland. The Cavs sent away an astonishing six players while adding four new players to their roster. They sent away Jae Crowder, Derrick Rose, Iman Shumpert, Channing Frye, Dwayne Wade, and Isaiah Thomas, who they just acquired this offseason. However, they upgraded in a major way adding loads of young talent in the form of Rodney Hood, George Hill, Jordan Clarkson, and Larry Nance Jr. These four young players will most certainly add Lebron with the support he needs in order to make a long playoff run. The length and athleticism of this new Cavaliers team has shaken up the entire Eastern Conference, who up until the trade deadline, viewed the Cavs as a very beatable team. 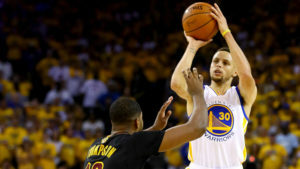 These new moves will almost certainly help them deal with the length and guard play of the Golden State Warriors should they meet them again in the finals this year. However, much like the Cavs, the Warriors will have their own issues returning to the NBA finals. The Warriors currently sit a half game back in their own conference to a new force: the Houston Rockets. This new look Rockets team has meshed and looks primed to push the Warriors to the limit come this playoffs. Going into the all-star break, the Rockets have won 10 games in a row and look to be a team on a mission. The offseason addition of point guard Chris Paul had many analysts questioning whether Paul could mesh with current superstar James Harden. Not only have they meshed, they seem to both be playing the best basketball of their careers. The high octane offensive play of Harden and Paul, coupled with Clint Capela, Ryan Andersen, and Trevor Ariza has many intrigued for a matchup with the defending champion Warriors. While many still predict another Golden State versus Cleveland final, it is far from a sure thing. The introduction of this new Rockets core coupled with the emergence of a new Kyrie Irving led Celtics team and conference leading Raptors in the East, have both teams in the fight of their lives to return to the championship. The second half of this season has all the potential in the world and promises to be an exciting final few months of basketball.